Dark Knight Rises picks up eight years after the previous instalment, with Batman blamed for Harvey Dent's death and retired, as Gotham no longer needs a hero. Quite similarly, Bruce Wayne has disappeared from public eye - now a bearded, limping recluse skulking around Wayne Manor. Your first impressions of Christian Bale in his third outing as Batman is he could not possibly don the cape again, let alone take on the frightening, psychotic and hulking menace that is Bane, masterfully played by Tom Hardy. Having seen him in Warrior, This is War and now Batman, Hardy is incredibly versatile and I am looking forward to seeing him in many more films in the coming years. But back to the Bat... to get Wayne shaved and back in his Lamborghini the audience needs to wait for the delightfully delicious Catwoman, Anne Hathaway, to prowl onto the scene and liberate some jewellery from the Wayne collection. Hathaway gets it right where Michelle Pfeifer just missed the target and Halle Berry got it completely wrong. Hathaway's Catwoman is tough, selfish and self-preservation is first and foremost on her mind - she betrays Batman to save herself, delivering him into the hands of Bane for the darkest moment of the film. Bane and Batman's epic slugfest takes place in the sewers of Gotham and when Batman kills the lights in attempt to gain the upper hand Bane chillingly says "You merrily adopted the darkness. I was born in it". Bane subsequently brutalises Batman and after incapacitating him, removes the mask and nonchalantly drops it into the sewer. At this point the audience can truly despair. Batman is broken and Bane's grandiose plan to burn Gotham unfolds. Bridges around Gotham are blown up, a stadium implodes, a nuclear bomb is activated and the only man able to disarm it is publicly executed. How could good possibly prevail after that? The scale of the film is much larger than the previous instalments, featuring thousands of extras. The fight scenes are awesome, the special effects are incredible and the instrumental soundtrack so perfectly captures the emotion of each scene. Back in Gotham the few remaining policemen, led by Commissioner Gordon (Gary Oldham ) and new comer Detective John Blake (Joseph Gordon-Levitt) have formed a small resistance to track Bane's movements and try what they can to reclaim a city isolated from the world - without the help of Batman. And this is an underlying theme of the film - any average person can be a hero - not only the Batman. Upon Batman's return to Gotham the final showdown with Bane takes place on the streets outside City Hall - a stark contrast to the previous battle in the city sewers. Unfortunately this second round is far less engrossing than the first. My greatest disappointment in the film was a blubbering announcement by Alfred (Michael Cane) - and all he seems to do in this movie is cry - that all he ever wished for Bruce Wayne was a happy ending and a life free of Batman. Well, surely that's not going happen... is it? Batman doesn't get the girl. He doesn't get the white picket fences and live happily ever after.... Well that's what I thought at the time, but it seems director Christopher Nolan had other ideas. And this leads to a very predictable and soppy ending for the diehard Batman fan. 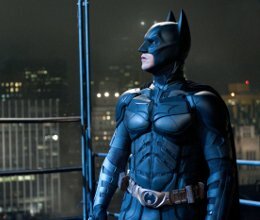 However, it does provide a very tidy transition out of the Batman franchise for the Nolan/Bale team (who from the get go were always only going to do the trilogy) and does tantalise the audience with a potential new Batman at the end � and it is after all called Dark Knight Rises - not Dark Knight Retires... But a Batman without Bruce Wayne - and a fresh-faced Batman at that - will be a tough sell on future audiences.